Visitation: Visitation will be Wednesday, September 19th, 2018 from 5-9pm with family present to greet friends from 6-8pm at Anderson Jones Corcoran Harrisburg Funeral Chapel. 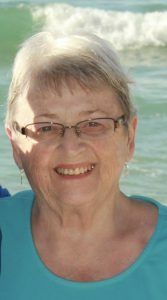 With heavy hearts but with joy of a life well lived, we announce the passing of Kathryn Marie Hootman (Gilchrist) of Harrisburg, SD. Kathryn, age 74, passed away on Saturday, September 15, 2018 surrounded by her family. Born November 27, 1943 to Myrtle Marie and Norris Wayne Gilchrist in Fairfield, IA. She attended Fairfield High School and also AIB in Des Moines, IA and graduated with a degree in accounting. On February 20, 1965 Kathryn married James Roger Hootman and were married for 53 wonderful years. She loved her family, traveling, reading, crafts and keeping up with her grandchildren’s activities. Her beautiful life will forever be cherished in the lives of her husband, James Hootman, Children, Susan Rotert (Tom) of Harrisburg, SD, Kary Holmes (Jim) of Sioux Falls, SD and her grandchildren, Cole Rotert (23), Shelby (17) and Ben Holmes (14). The family will receive friends at the Anderson-Jones-Corcoran Harrisburg Funeral Chapel (110 W. Willow Street, Harrisburg, SD) on Wednesday September 19, 2018 from 5-9pm with family present to greet friends from 6-8pm. She will be laid to rest in a private family gathering at Pleasant View Cemetery in Harrisburg, SD. In lieu of flowers, the family request a memorial for the American Arthritis Foundation in her name. A wonderful wife, mom and granny, we will never forget your love………..
Kary, I was so sorry to hear about the loss of your Mom. Know that we are thinking of you and your family right now. My family and I are sending our prayers for your family and we will be making a donation to the American Arthritis Foundation in her honor. So very sorry for your loss! I remember visiting often with Kathryn when she came into HyVee. Prayers of comfort for the family! Blessings to you all! My family and I were so saddened to hear of Kathryn’s passing. We have made a donation to the American Arthritis Foundation in her name and we will be keeping the family in our thoughts and prayers. Our hearts go out to you as you grieve and remember wonderful occasions at the same time. One of the nicest, kind lady I’ve ever met. Condolences to Jim, Susan, Kary and family. Our hearts and thoughts are with you. Evan and I donated to the American Arthritis Foundation on behalf of Kathryn. Our thoughts and prayers are with you & your family at this tough time! Jim and Family, I am so sorry for your loss what an unexpected call I received from one of our classmates. Jim please know that Connie s and my thoughts and prayers are with you and your family, what a tragic loss. You know better than I what a wonderful classmate and friend she was to all. Jim keep your chin up as you know she would want you to and look after your wonderful family. I am so sorry for your loss. She was such an amazing person and I know how close you all are to her. She has left her mark on all of us and she will be missed dearly. Wish I was there to give you all a big hug! I am sure she is in full riot stance as the angels all anxiously greet her in heaven. Love and miss you all and will keep you in my prayers. Sending love and prayers. I loved her so much and will miss her every single day.